Capone went to work for Yale's old mentor, John Torrid. Torrid saw Capone's potential, his combination of physical strength and intelligence, and encouraged his port�ig�i. Soon Capone was helping Torrid manage his bootlegging business. By mid-1922 Capone ranked as Trio�s number two men and eventually became a full partner in the saloons, gambling houses, and brothels. When Torrid was shot by rival gang members and consequently decided to leave Chicago, Capone inherited the "outfit" and became boss. The outfit's men liked, trusted, and obeyed Capone, calling him "The Big Fellow." He quickly proved that he was even better at organization than Torrid, syndicating and expanding the cities vice industry between 1925 and 1930. Capone controlled speakeasies, bookie joints, gambling houses, brothels, horse and race tracks, nightclubs, distilleries and breweries at a reported income of $100,000,000 a year. He even acquired a sizable interest in the largest cleaning and dyeing plant chain in Chicago. Although he had been doing business with Capone, the corrupt Chicago mayor William "Big Bill" Hale Thompson, Jr. decided that Capone was bad for his political image. Thompson hired a new police chief to run Capone out of Chicago. When Capone looked for a new place to live, he quickly discovered that he was unpopular in much of the country. He finally bought an estate at 93 Palm Island, Florida in 1928. Political cartoon depicting Chicago's growing reputation for violence. 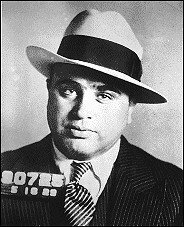 Attempts on Capone's life were never successful. He had an extensive spy network in Chicago, from newspaper boys to policemen, so that any plots were quickly discovered. Capone, on the other hand, was skillful at isolating and killing his enemies when they became too powerful. A typical Capone murder consisted of men renting an apartment across the street from the victim's residence and gunning him down when he stepped outside. The operations were quick and complete and Capone always had an alibi. Valentine's Day Massacre of 1929. Capone's most notorious killing was the St. Valentine's Day Massacre. On February 14, 1929, four Capone men entered a garage at 2122 N. Clark Street. The building was the main liquor headquarters of bootlegger George "Bugs" Moran's North Side gang. Because two of Capone's men were dressed as police, the seven men in the garage thought it was a police raid. As a result, they dropped their guns and put their hands against the wall. Using two shotguns and two machine guns, the Capone men fired more than 150 bullets into the victims. Six of the seven killed were members of Moran's gang; the seventh was an unlucky friend. Moran, probably the real target, was across the street when Capone's men arrived and stayed away when he saw the police uniforms. As usual, Capone had an alibi; he was in Florida during the massacre. were members of rival "Bugs" Moran's gang. Capone had headquarters in Chicago proper in the Four Deuces at 2222 S. Wabash, the Metropole Hotel at 2300 S. Michigan Avenue, and the Lexington Hotel at 2135 S. Michigan Avenue. He expanded into the suburbs, sometimes using terror as in Forest View, which became known as "Caponeville." Sometimes he simply bribed public officials and the police as in Cicero. He established suburban headquarters in Cicero's Anton Hotel at 4835 W. 22nd Street and in the Hawthorne Hotel at 4823 22nd Street. He pretended to be an antique dealer and a doctor to front his headquarters. Because of gangland's traditional refusal to prosecute, Capone was never tried for most of his crimes. He was arrested in 1926 for killing three people, but spent only one night in jail because there was insufficient evidence to connect him with the murders. When Capone finally served his first prison time in May of 1929, it was simply for carrying a gun. In 1930, at the peak of his power, Capone headed Chicago's new list of the twenty-eight worst criminals and became the city's "Public Enemy Number One." The popular belief in the 1920s and 30s was that illegal gambling earnings were not taxable income. However, the 1927 Sullivan ruling claimed that illegal profits were in fact taxable. 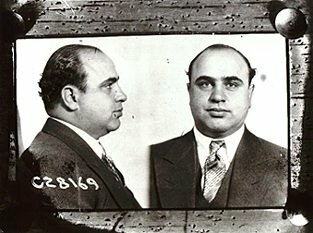 The government wanted to indict Capone for income tax evasion, Capone never filed an income tax return, owned nothing in his own name, and never made a declaration of assets or income. He did all his business through front men so that he was anonymous when it came to income. Frank Wilson from the IRS's Special Intelligence Unit was assigned to focus on Capone. Wilson accidentally found a cash receipts ledger that not only showed the operation's net profits for a gambling house, but also contained Capone's name; it was a record of Capone's income. Later Capone's own tax lawyer Lawrence P. Mattingly admitted in a letter to the government that Capone had an income. Wilson's ledger, Mattingly's letter, and the coercion of witnesses were the main evidence used to convict Capone. Hmm I t hink, um well. U FORGOT TO MENTION. THAT HE MOVED HE ALSO LIVED IN MOOSE JAW SASKATCHEWAN. Hey also was a gangster their and he made Moose Jaw nickname the little chicago. I read the book.. did you read the book? There's an old saying: "There are two certainties in life... death.. and taxes." Capone couldn't get convicted on the one, so they got him on the other! I heard once that he hid things in his grandfather clock when the police raided his home, guess he forgot a piece of paper. how does that affect YOUR life..?? I agree with Mohamed - and the sooner the better... at least by November 2008! Mohamed says in his profile that he wants to show the face of Islam. Mohamed (the original) instucted his followers to "Kill the Infidels." I'd rather not see THAT face. All Gods are one, and I think people who believe in killing God's other children need to change the way they think. I shall pray for Mohamed (the 18year old, public school educated ignoramus) to find his salvation in the Lord Jesus Christ, so that he can lead his misinformed brothers and sisters to the light. I am not attempting to defame or offend you. Your biggest problem is that you were educated by union democrats who want to keep you ignorant of those things you need to know to be successful in life. No wonder. Someone with the name mohamed feels Bush is terrorist. However terrorism in another country is great? I'll go for the lesser of the two evils. Besides how can you be upset when the ones our boys are up against have no regard for their own lives. Either way, I'm thrilled. Sadam Hung! And he Hung like a scared coward!